Thankfully, my boy is on the mend. 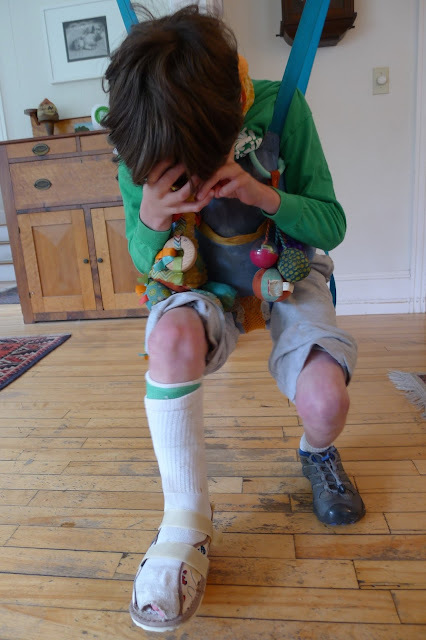 Tuesday morning we saw Calvin's awesome orthopedic specialist who put him in a sleek green fiberglass cast that he can bear weight on, complete with a simple cast shoe. Turns out that the metatarsal fracture, a straight, green break like that of a sapling, will heal in just three weeks because it is unlikely to shift position and it extends into the growth plate. This was the best news we could have asked for. Today, Calvin is recovering from yesterday's grand mal yet still enduring several partial seizures in its wake. The kid just can't seem to catch a break, except when he falls out of bed and lands right on his toe. I'm glad it will only be three weeks. Children heal quickly thank goodness. I'm so relieved to hear it. I have been thinking about ya'll constantly and even tried to call when I heard about the injury, but your phone was busy for hours! I love you and miss you.